Incredible Tree Lilies® - Grow a Fragrant Hedge! These breathtaking tree lilies® are the result of painstaking breeding and can grow as tall as 2.5m (8ft) in as little as two years! One single tree lily® bulb can produce up to thirty 20cm (8in) trumpet blooms and will take on a shrub-like appearance over the years, creating a truly lavish display. The sturdy stalks are almost 5cm (2in) thick, so they won't need supporting and the foliage will remain lush all season. Growing tree lilies® couldn't be easier - simply plant them in a sunny or part-shaded spot of the garden against walls or fences or in large pots and let them look after themselves! 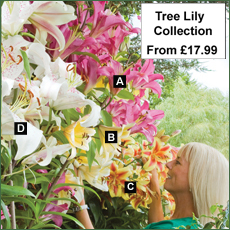 Tree Lilies® are available to buy online, either separately or as part of a collection. Please see below for details. Wow! 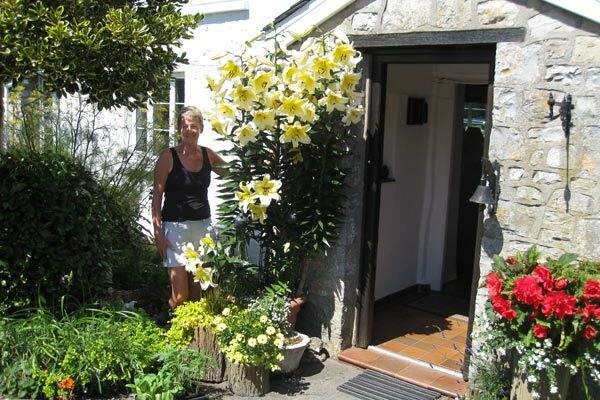 These stunning tree lilies® were grown by Maggie Coyle of Glamorgan, who came 4th in our Tree Lily® Photo Competition! The Tree Lily® Collection features 'Pink Explosion', 'Yellow Rocket' and 'Starburst' and is priced at £17.99 for 9 top-sized bulbs (3 of each variety) or £29.99 for 18 top-sized bulbs (6 of each variety).